When it’s snowy or icy, the yards can get treacherous to walk on,especially in wellies and especially if there’s been a partial thaw and refreeze! Although everywhere looks clean and pristine when covered in a blanket of snow, it soon gets discoloured and if the tractor diesel freezes too, it makes life very difficult. 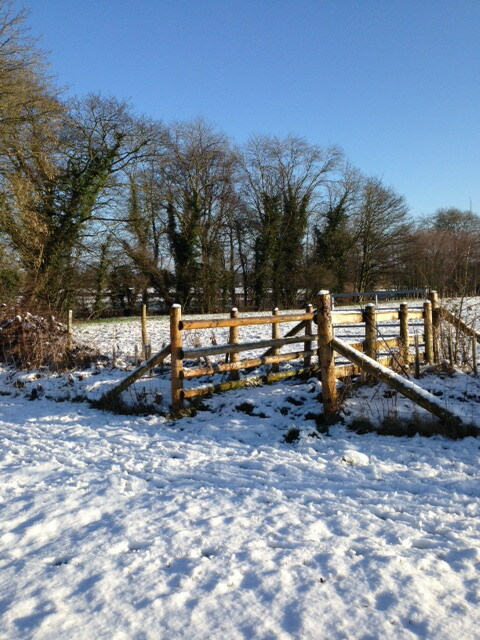 Water pipes- often in the open- freeze and troughs need thawing, to make sure every animal can access enough water for drinking. Out in the fields, the main problem is not always knowing if a pipe has burst( or where) until you notice a boggy bit. Sheep can survive by eating snow but cattle need a huge amount- dairy cattle consume 100kg of grass/fodder daily and drink approximately 60litres of water, giving us 30litres of milk daily in return. Over the last few years, we have planted quite a bit of Holly as we’ve replanted and gapped up hedges. Holly can grow in slightly drier conditions and so we have put some where they are close to mature tree canopies, but they are comparatively slow growing and take longer to fill up the hedge. Older bushes should be bearing the bright red berries, carried by the female, and the birds are attracted to the colour and help to spread the seed far and wide. The leaves can be carried on the tree for up to 4/5 years before falling. As there are fewer daylight hours, we are more often aware of the Owls as they call to each other and we see more nocturnal animals, such as Stoats, hunting prey. Owls leave their regurgitated pellets on gate posts or wherever they like to sit and if we pull them apart we can see what they’ve been eating- small bones and feathers and beetle remains. Ted is now three and is a good working sheep dog, often better working away from home. When in work mode, he is very single minded and cannot often be distracted and he has grown into a large sleek dog, even though he has had a couple of rough times since he was a puppy. Although he likes to spend part of his evening inside with us, he soon decides enough is enough and asks to be let out to curl up in his kennel or in a cosy spot in the sheep shed when it’s lambing time. Our calves have been weaned and we have a couple of noisy nights as they get used to missing their milk. This winter we may get rid of Dallas, our limousine bull, as he is nine now and we have too many of his daughters in the herd, but that has yet to be decided!